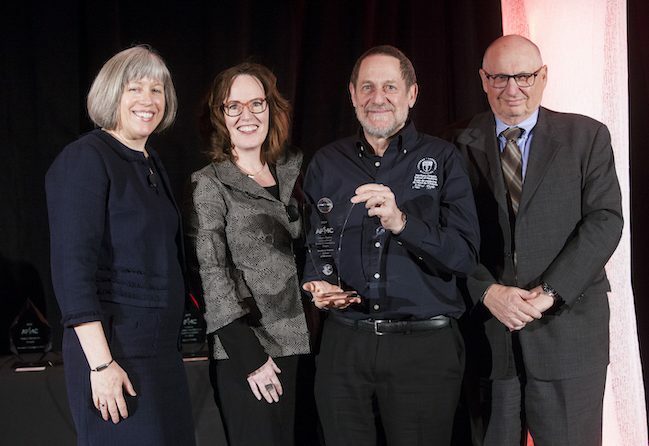 The Northern Ontario School of Medicine (NOSM) was presented with the Charles Boelen International Social Accountability Award by the Association of Faculties of Medicine of Canada (AFMC) during a ceremony on April 14 at the Conference on Canadian Medical Education at the Scotiabank Convention Centre in Niagara Falls, Ontario. Named after Dr. Charles Boelen, a world leader in social accountability in medical education, the award aims to celebrate people or organizations whose professional accomplishments are reflective of the principles of social accountability, including a focused response to the priority health concerns of citizens and society in education, research and service delivery missions. NOSM is the first medical school in Canada established with an explicit social accountability mandate. The School is committed to addressing the health needs of all Northern Ontarians and improving access to quality care through education and research. Since 2009, there have been 595 graduates of NOSM’s MD program. The majority of NOSM medical students come from the North and many choose to stay in the North upon completion of their studies. More than 90 communities participate in the education of NOSM students. Throughout the School’s four-year MD program, medical students have the unique opportunity to live and learn in these communities. All medical students complete a four-week placement in an Indigenous community in their first year, and two four-week placements in rural and remote communities in their second year. NOSM was also the first medical school in the world at which all medical students complete a Longitudinal Integrated Clerkship (LIC), the Comprehensive Community Clerkship—an eight-month third-year placement during which the students live and learn in one of 15 mid-sized communities in the region. As part of its social accountability mandate, NOSM has the responsibility to engage partners at all levels across Northern Ontario, including those in Indigenous, Francophone, and rural and remote communities. Since 2003, the School has sought guidance from these communities, bringing together members from treaty organizations, Elders, physicians, community leaders, nurses and other health-care professionals from across the North to learn from their invaluable experience and expertise. The key elements of the School’s community-engaged learning model are a direct result of their input. The work of NOSM researchers also plays a key role in fulfilling the School’s social accountability mandate. For years, Canadian health research took place primarily in large cities, leaving unanswered questions about health issues affecting Northern Ontarians, as well as issues specific to Indigenous and Francophone communities in the region. Today, there are many NOSM faculty members—medical anthropologists, sociologists and biologists, immunologists, physicians, other clinicians and more—who conduct leading-edge health research in the lab, in communities, in hospitals, in health clinics and in administrative offices across Northern Ontario.